Wedding PR: Rustic Weddings, Honeybook, Destination I Do, and more! Talk about a great roundup of features! With everything from Rustic Weddings to Destination I Do, this is one for the books. 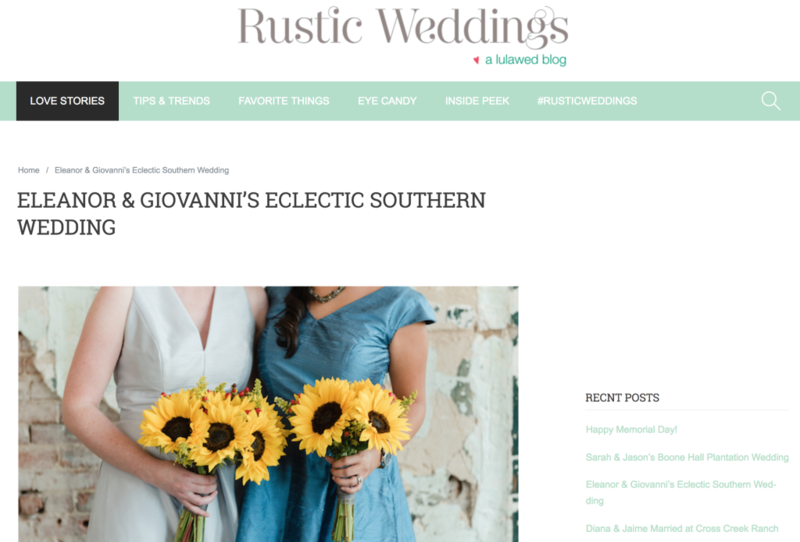 Sunshower Photography was featured on Rustic Weddings with their real wedding, Eleanor & Giovanni’s Eclectic Southern Wedding. See the full feature here. 100 Candles was featured on Catersource with their guest article, Let’s Talk about LED Lights. See the full feature here. Belladeux Event Design was featured on Honeybook with their guest article, The Growing Pains of a New Business. See the full feature here. The International Academy of Wedding & Event Planning was featured on Book More Brides with their guest article, Why You Should Embrace Storytelling Marketing. See the full feature here. Belladeux Event Design was featured on Catersource with their guest article, What’s the Right Wedding Experience for a Client? See the full feature here. The International Academy of Wedding & Event Planning, Be Photography, 100 Candles, and Destination Weddings Travel Group were featured on Brides365 in the article, Will You Be My Bridesmaid? See the full feature here. Wente Vineyards was featured on Catersource with their guest article, Best Practices for Catering Outdoor Summer Events. See the full feature here. Destination Weddings Travel Group was featured on Catersource with their guest article, 2017 Trend: Destination Wedding Welcome Dinner. See the full feature here. Be Photography was featured on Borrowed & Blue with their real wedding, Grace & Harry: Red & White Fall Wedding in Towson. See the full feature here. Destination Weddings Travel Group was featured on Destination I Do with their real wedding, Classy Costa Rica Wedding. See the full feature here.